Employers are increasingly concerned about their ability to find workers with the skills they need to keep their companies successful. They call it a skills gap, and much of the attention has been on middle skills – those that require more than a high school diploma but less than a four-year college degree. Typically that means one or two years of training or study beyond high school – associate degrees, certificates or even apprenticeships – and usually some on-the-job training. Based on data from the U.S. Department of Labor’s O*NET database of occupations and education, experience and training requirements, about 53 percent of the jobs in the Idaho economy are considered low skilled – those needing no more than a high school diploma. Twenty-six percent fall into the middle-skills category while 22 percent are considered high skilled. That breakdown essentially mirrors the national economy where 52 percent of jobs are low skilled, 26 percent middle skilled and 23 percent high skilled. Using the O*NET methodology, Economic Modeling Systems International – a Moscow-based econometrics firm – projects the breakdown of jobs by skill level will not change much over the next decade in either Idaho or the nation. Construction has been considered one of the better-paying sectors in the Idaho economy, and during the mid-2000s boom it accounted for 8 percent of all Idaho jobs. But the recession claimed 22,000 construction jobs – 40 percent of all jobs lost – and as it turned out most of those were considered low-skilled. By contrast, retail in Idaho, which accounts for about 10 percent of all jobs in 2012 and the majority of the state’s jobs requiring lower skills like cashiers, salespeople and office clerks, lost just 8,500 jobs during the recession. 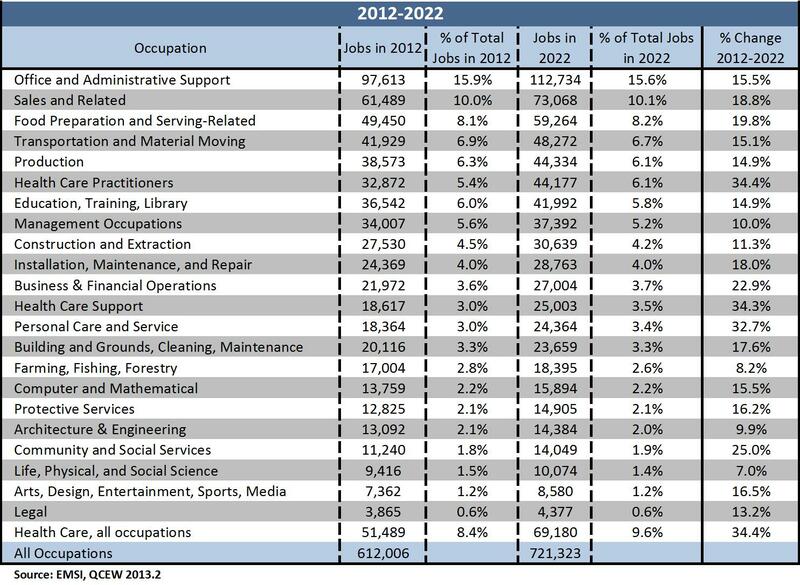 Office and administrative support occupations made up nearly 16 percent of all jobs in 2012, and many of them require minimum skills. Trucking also accounts for a marked share of these jobs. Since many of the jobs requiring minimum skills are in the service sector, that will only persist as retirees continue to migrate to Idaho and increase demand for those services. Health care occupations comprised 8.4 percent of total Idaho jobs in 2012 and are expected to jump to 9.6 percent by 2022. That is the largest projected increase for any occupational group. Fortunately, half the health care jobs are considered middle skilled and the other half high skilled, creating opportunity for many Idahoans. The number of middle-skilled jobs is projected to grow 18.8 percent in Idaho from 158,906 in 2012 to 188,751 in 2022, but that will remain 26 percent of total jobs. Low-skilled jobs will grow 17.9 percent while high-skilled jobs will increase 16.7 percent. The bulk of the growth projected over this decade will be in the health care sector. This growth rate in middle-skilled jobs is faster than the growth rates nationally or for the surrounding states with the exception of Utah, where jobs at each skill level are projected to grow between 22 percent and 26 percent. With Boeing’s extensive operations in Washington, that state claims the most high-skilled jobs in the Northwest at 24 percent. Workers need more training today, but that is the result of technological advances and not necessarily a shift from low- to middle- or middle- to high-skilled jobs. Technology has become part of more middle-skilled occupations, which has meant entry into those occupations requires a higher level of training than in the past. This entry was posted in Employment News and tagged gap, idaho department of labor, job skills, workers on April 10, 2014 by Idaho Department of Labor.